The Best Western Hotel Elefant Salzburg is located off the Getreidegasse in the heart of the Old Town. This Salzburg hotel is within walking distance of many famous places of interest, including the Salzburg Zoo, the River Salzach, St. Peter's Abbey, the Hohensalzburg Fortress, festival halls, art museums, and the Mirabell Gardens. The Salzburg airport is in close proximity to the Best Western Hotel Elefant Salzburg. Taxi services and public transportation is easily arranged. Most attractions are within walking distance of the hotel, and there are many bicycle paths throughout the city. The Best Western Hotel Elefant Salzburg offers en suite baths in each of the guest rooms, with hair dryers and complimentary toiletries. All rooms are equipped with satellite television, clock radios, and a mini-bar. Green rooms are available for persons with allergies, and there is 24-hour room service. This 700-year-old building has been extensively renovated to offer modern amenities. 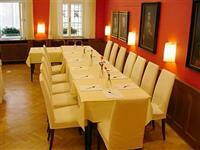 The Best Western Hotel Elefant Salzburg offers an on-site bar and restaurant. Business travelers may make use of the wireless Internet and conference rooms. A 24-hour front desk service is available, as well as laundry facilities and parking.